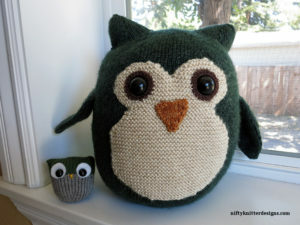 Who doesn’t love a big, squishy owl? Who? Who? 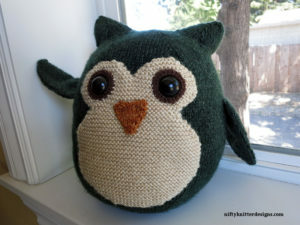 Giles the Owl was named by my husband after I made the owl for his birthday. Giles doesn’t mind being quite round. He just loves to cuddle! 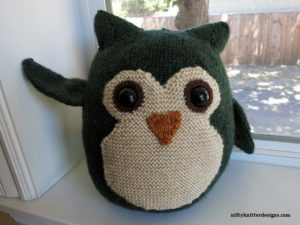 Giles makes a perfect gift for anyone who loves cuddly animals — kids and adults alike! 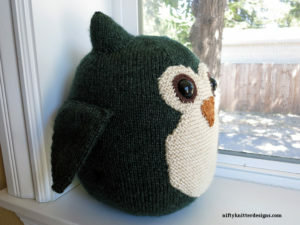 The finished size is approximately 11.5 inches (29.2 cm) in height and 9 inches (22.9 cm) in width. 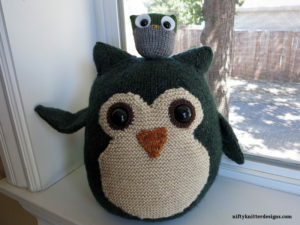 The eyes are 22 mm safety eyes. Note that you can use a separate color for the background of the eyes if the belly color you choose does not work well for eyes. Size 6 US (4.0 mm) needles (24 inch / 61 cm circular or double pointed). 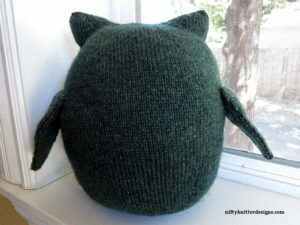 Approximately 290-310 yards (265-283 m) worsted weight yarn in main body color (green shown). Approximately 45-50 yards (41-46 m) worsted weight yarn in contrast body color (cream shown). 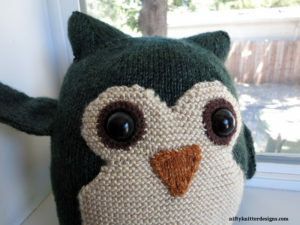 Less than 5 yards (4.5 m) worsted weight yarn in eye color (brown shown). Less than 5 yards (4.5 m) worsted weight yarn in beak color (orange shown). Black 22 mm safety eyes (2). 6 stitch markers (one in a distinct color to represent the beginning of the round). Tapestry needle to sew pieces together and weave in ends. 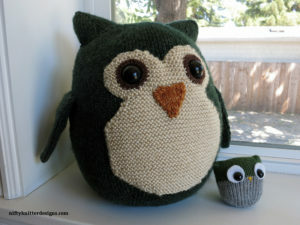 Note: The smaller owl in the photos is the free Owl Puffs pattern by Jenna Krupar.